Modified Version (“Hack”) Copyright (c) 2015, Christopher Simpkins with Reserved Font Name Hack. DejaVu modifications of the original Bitstream Vera Mono typeface have been committed to the public domain. This Font Software is licensed under a modified version of the SIL Open Font License, Version 1.1 and the Bitstream Vera License. The modifications to the SIL Open Font License permit the use of multiple font licenses for the release of modified or unmodified versions of this font, in part or in whole. These changes are in the preamble and section 5 of the accompanying modified SIL Open Font License text below. These licenses are copied below. PREAMBLE The goals of the Open Font License (OFL) are to stimulate worldwide development of collaborative font projects, to support the font creation efforts of academic and linguistic communities, and to provide a free and open framework in which fonts may be shared and improved in partnership with others. The OFL allows the licensed fonts to be used, studied, modified and redistributed freely as long as they are not sold by themselves. The fonts, including any derivative works, can be bundled, embedded, redistributed and/or sold with any software provided that any reserved names are not used by derivative works. The requirement for fonts to remain under this license does not apply to any document created using the fonts or their derivatives. DEFINITIONS “Font Software” refers to the set of files released by the Copyright Holder(s) under this license and clearly marked as such. This may include source files, build scripts and documentation. 5) The Font Software, modified or unmodified, in part or in whole, must be distributed under this license. The requirement for fonts to remain under this license does not apply to any document created using the Font Software. TERMINATION This license becomes null and void if any of the above conditions are not met. DISCLAIMER THE FONT SOFTWARE IS PROVIDED “AS IS”, WITHOUT WARRANTY OF ANY KIND, EXPRESS OR IMPLIED, INCLUDING BUT NOT LIMITED TO ANY WARRANTIES OF MERCHANTABILITY, FITNESS FOR A PARTICULAR PURPOSE AND NONINFRINGEMENT OF COPYRIGHT, PATENT, TRADEMARK, OR OTHER RIGHT. IN NO EVENT SHALL THE COPYRIGHT HOLDER BE LIABLE FOR ANY CLAIM, DAMAGES OR OTHER LIABILITY, INCLUDING ANY GENERAL, SPECIAL, INDIRECT, INCIDENTAL, OR CONSEQUENTIAL DAMAGES, WHETHER IN AN ACTION OF CONTRACT, TORT OR OTHERWISE, ARISING FROM, OUT OF THE USE OR INABILITY TO USE THE FONT SOFTWARE OR FROM OTHER DEALINGS IN THE FONT SOFTWARE. Copyright (c) 2003 by Bitstream, Inc. All Rights Reserved. Bitstream Vera is a trademark of Bitstream, Inc. The Font Software may be modified, altered, or added to, and in particular the designs of glyphs or characters in the Fonts may be modified and additional glyphs or characters may be added to the Fonts, only if the fonts are renamed to names not containing either the words “Bitstream” or the word “Vera”. This License becomes null and void to the extent applicable to Fonts or Font Software that has been modified and is distributed under the “Bitstream Vera” names. The Font Software may be sold as part of a larger software package but no copy of one or more of the Font Software typefaces may be sold by itself. THE FONT SOFTWARE IS PROVIDED “AS IS”, WITHOUT WARRANTY OF ANY KIND, EXPRESS OR IMPLIED, INCLUDING BUT NOT LIMITED TO ANY WARRANTIES OF MERCHANTABILITY, FITNESS FOR A PARTICULAR PURPOSE AND NONINFRINGEMENT OF COPYRIGHT, PATENT, TRADEMARK, OR OTHER RIGHT. IN NO EVENT SHALL BITSTREAM OR THE GNOME FOUNDATION BE LIABLE FOR ANY CLAIM, DAMAGES OR OTHER LIABILITY, INCLUDING ANY GENERAL, SPECIAL, INDIRECT, INCIDENTAL, OR CONSEQUENTIAL DAMAGES, WHETHER IN AN ACTION OF CONTRACT, TORT OR OTHERWISE, ARISING FROM, OUT OF THE USE OR INABILITY TO USE THE FONT SOFTWARE OR FROM OTHER DEALINGS IN THE FONT SOFTWARE. Except as contained in this notice, the names of Gnome, the Gnome Foundation, and Bitstream Inc., shall not be used in advertising or otherwise to promote the sale, use or other dealings in this Font Software without prior written authorization from the Gnome Foundation or Bitstream Inc., respectively. For further information, contact: fonts at gnome dot org. No frills. No gimmicks. Hack is hand groomed and optically balanced to be a workhorse face for code. It has deep roots in the libre, open source typeface community and expands upon the contributions of the Bitstream Vera & DejaVu projects. 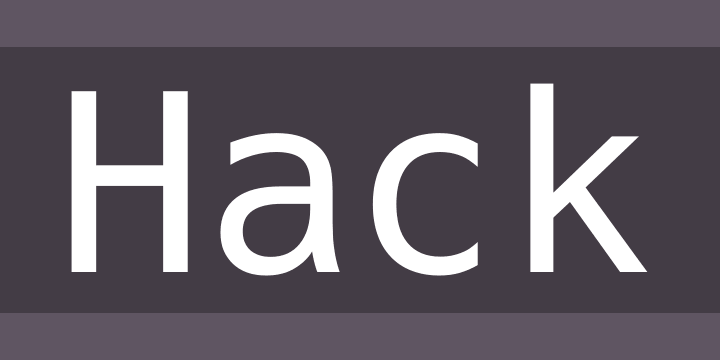 The face has been re-designed with a larger glyph set, modifications of the original glyph shapes (including distinct point styles and semi-bold punctuation weight in the regular set to make analphabetic characters less transparent), and meticulous attention to metrics (including numerous spacing adjustments to improve the rhythm of the face and the legibility of code at small text sizes). The large x-height + wide aperture + low contrast design combined with Type 1 hinting/hint replacement programs and a TrueType instruction set make it highly legible at commonly used source code text sizes with a sweet spot that runs in the 8px - 12px range on modern desktop and laptop monitors. Combine it with an HD monitor and you can comfortably work at 6 or 7px sizes.